VAN WERT – Have you ever wondered what it takes to become a foster parent? Do you have questions about the process? Are you concerned you don’t have what it takes? Are you interested in adoption? The Marsh Foundation Foster Care and Adoption Center is holding a free event that can help answer these questions and more. On Thursday, Nov. 8, between 6-8 p.m. you can attend an informational open house and have all of your questions answered. This event offers a no obligation opportunity to ask questions. Information will be provided in a relaxed environment. • The licensing process takes 3-6 months. • Couples and single individuals are eligible. • Complete, extensive training is provided prior to child placement (36 hours). • Supportive, 24-hour on-call consultation available. • Substantial reimbursement for those who qualify. • We only place kids in your home that you accept. • Potential parents must be 21 or older. • Parents may own or rent their home. 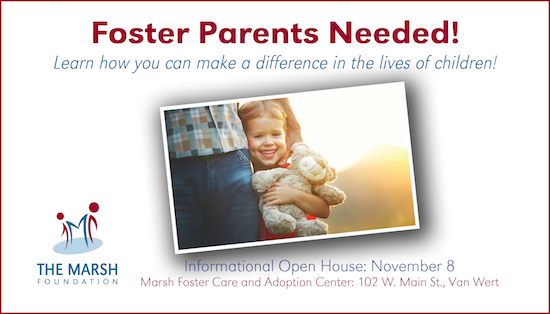 The Marsh Foundation Foster Care and Adoption Center is located 102 W. Main St. Marsh Foundation representatives will be on hand to answer questions. Refreshments will also be provided. The Marsh Foundation is a not-for-profit children’s services agency that provides services in a variety of settings. Services include group homes, family foster care (ages 0-17), an intensive treatment program, adoption and independent living. Located in Van Wert, the organization’s group homes are licensed for up to 36 children ages 7-17, offers an on-campus school for grades 2-12 and provides a variety of clinical services to group home residents, foster care children and community members.